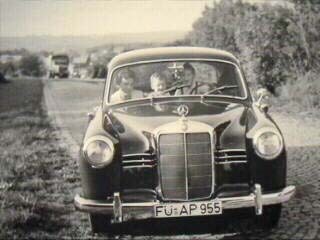 Here is Uwe (the young man in the middle) in his father's Mercedes-Benz Type 180 sedan at home in Germany in the 1950s. 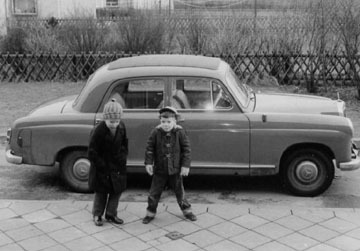 When Uwe was 20 years old in 1976, he bought a Ponton of his own. 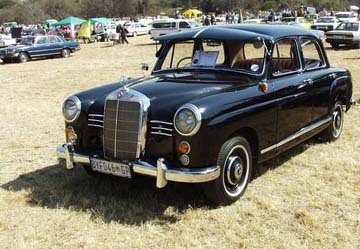 It was a 1957 Type 190 sedan. 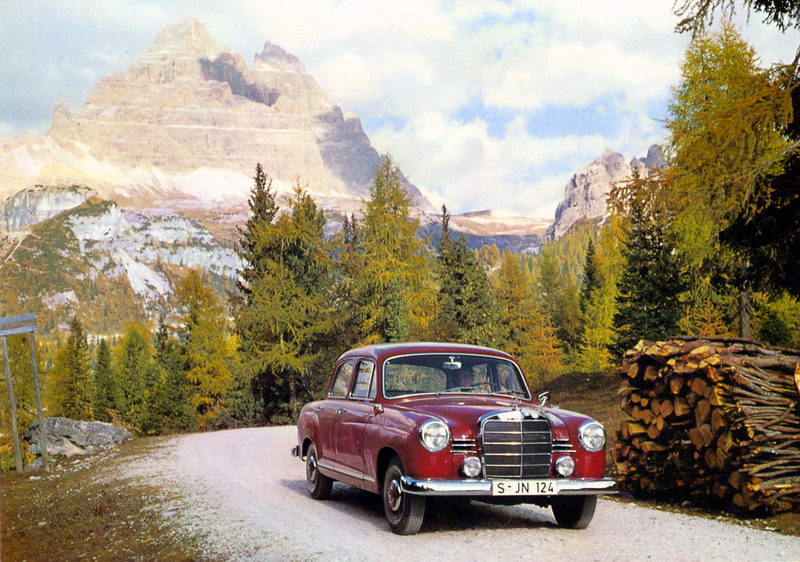 At that time, he was in the German Army and drove it many places (including Italy) until he sold it in 1979. 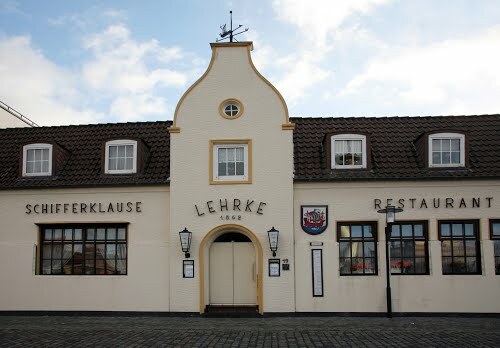 Another 24 years would pass before he discovered in May 2003 that it was still alive and well in the USA He located his name on a webpage that listed him (in the official Kraftfahrzeugbrief) as one of the former owners. 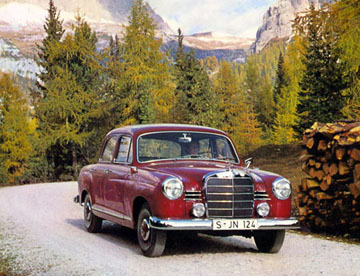 The 1957 Type 190 was found to be owned by Jeff Miller, the editor of this Mercedes-Benz Ponton website. 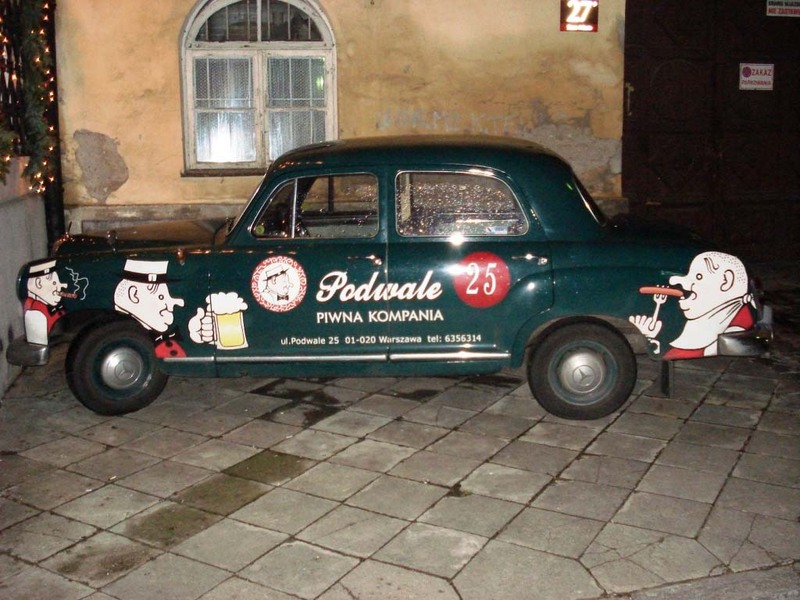 Kaputt / Don't Drink and Drive! 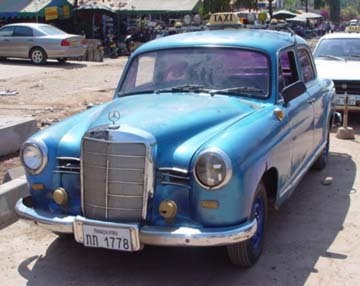 On a recent vacation trip to Laos, I spotted this Ponton taxi patiently waiting for its owner to finish lunch in Vientienne, the capital city. It looks a bit worse for wear, but after a while, the owner emerged and off they went in search of customers. It was still running well although it seems that the owner has done some backyard repair jobs. 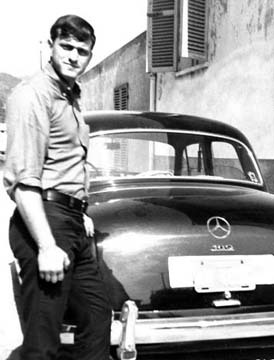 A few days ago a friend from Los Angeles sent me this image form his family album, which was captured in 1965 in northern Iran near Caspian sea. 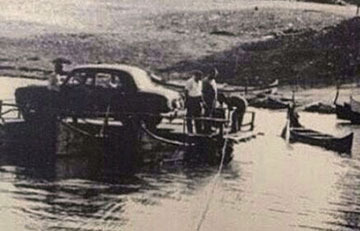 Their friend's Ponton was transferred to the other side of Cham-Khaleh river by ferry. 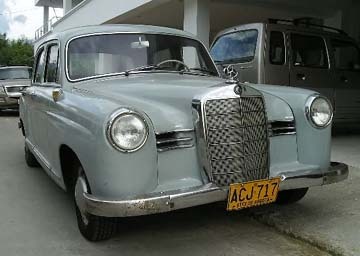 I saw this Ponton during a vacation to Varadero, Cuba in May 2006, and then again in May 2009. 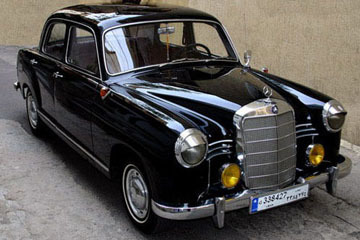 I will look for it in February 2011, and maybe find out what year and model it is. 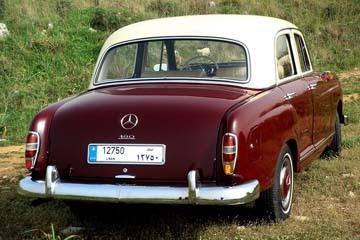 A reader of this page contacted the editor on March 29, 2008 and reported that the color of the "04" 180D is "dullish gray" and is still the same color after all these years, and has not been resprayed. 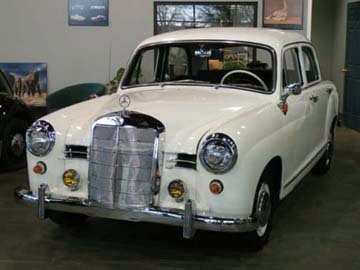 It is currently in the Mercedes-Benz Museum in Stuttgart. 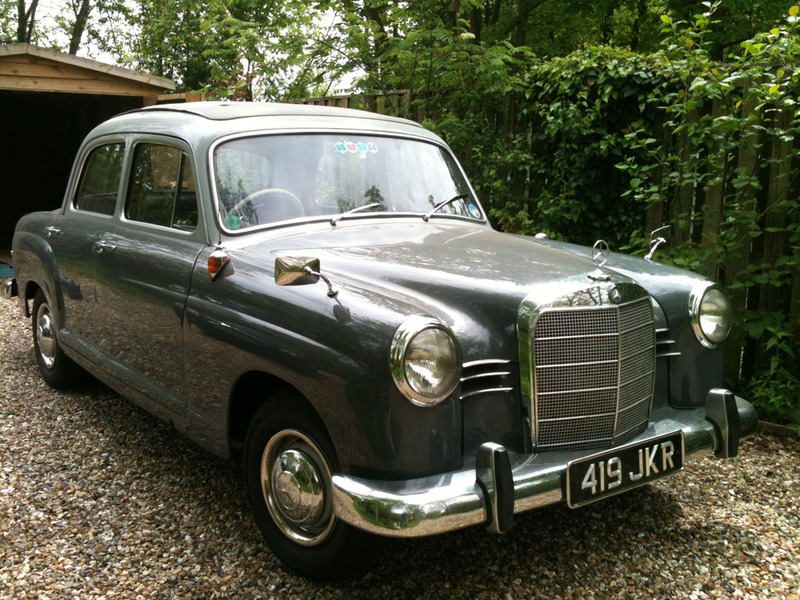 Paul writes, "I recently acquired this 1956 Type 180 Ponton sedan. 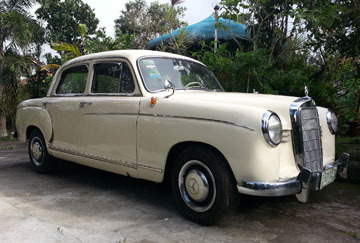 It is in running condition, and ready to be restored. 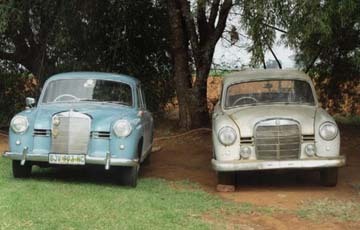 I am going through the process of understanding the details of the vehicle before the restoration begins." 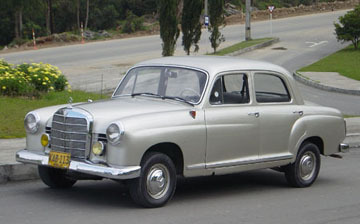 This Right Hand Drive Type W120 180 sedan belonged to Bakshi Ghulam Mohammed, the Prime Minister of Kashmir from 1953-1964. 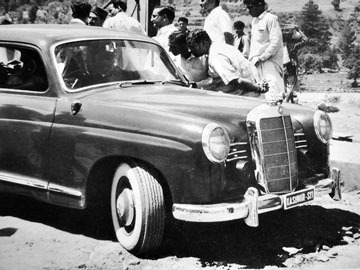 Bakshi Ghulam Mohammed used this car extensively to tour the Kashmir countryside. 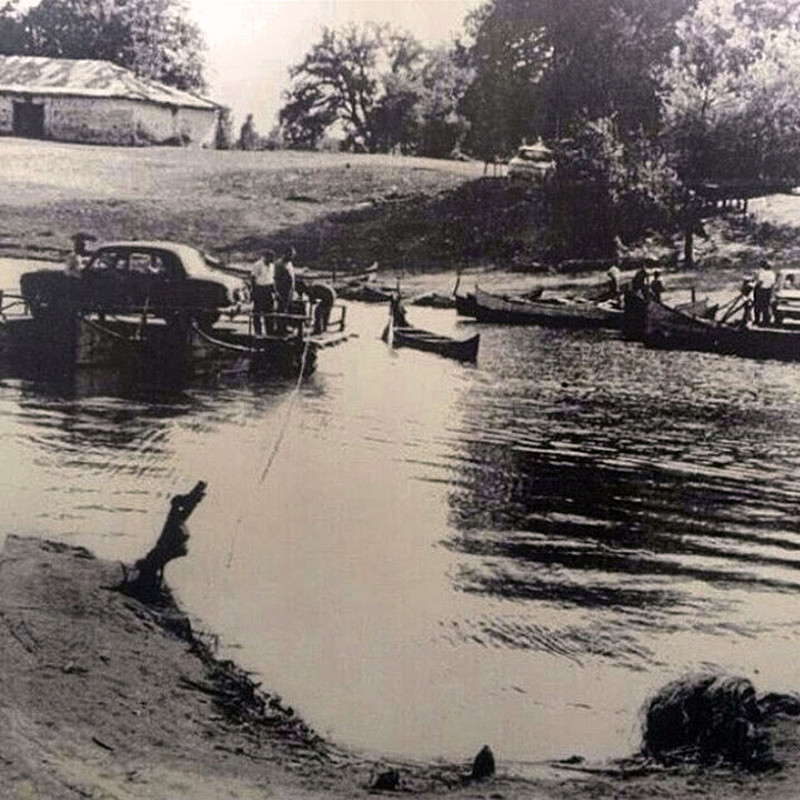 He can be seen in the front passenger seat in this photograph. 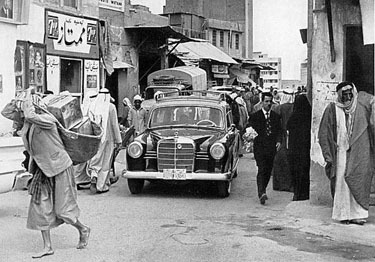 An internet search on his name "Bakshi Ghulam Mohammed" (1907-1972) will yield more details. Note the license plate reads, "KASHMIR-S11." 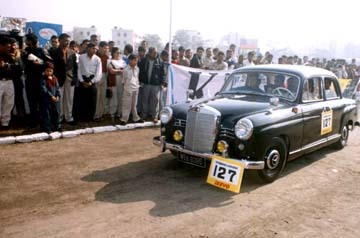 I am sending a photo of my 1956 180D which won third prize in the best restored classic cars category at the rally held in Mumbai on the 22nd of April 2007. I would be happy if you put her up in the ranks with all our other club member's beauties. By the way, she managed to beat a 300S for the prize. First and second were a Rolls-Royce and a Bentley. 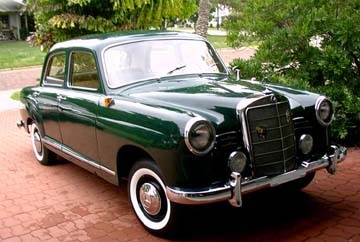 I know this would be impossible without all the help and support from International Ponton Owners Group (IPOG). 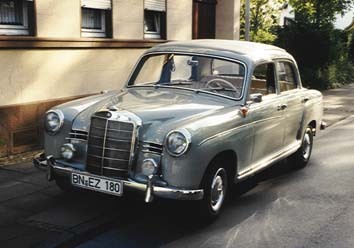 Steffen's father bought the 180D "used" (pre-enjoyed) in 1959. 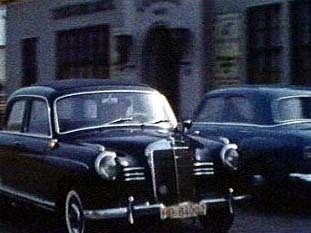 Note the mirror at the driver's door, and the rear window defroster. 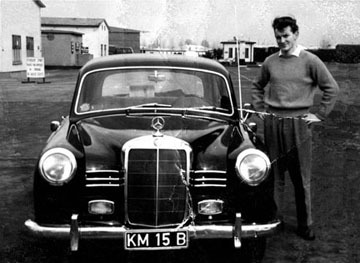 This photo shows fellow Mercedes-Benz salesman Heinz Piotraschke in front of the Restaurant Schifferklause Lehrke (Bremerhaven) in a used Type 180 Ponton with temporary red tags. 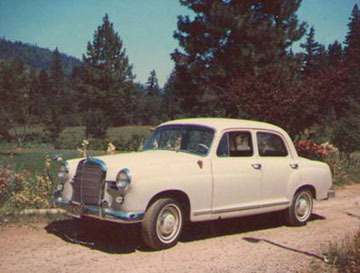 Note the modifications made to this example — chrome accent strips on the front fenders and along the bottom of the windows, as well as long, fender-mounted turn signals (normally found on the Type 219 and 220S/SE Pontons). 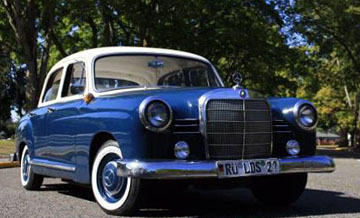 Hartwig recalled, these modifications could be carried out at the dealership at the customer's request after the car left the factory. The Webasto sliding roof can also be seen in this photo. 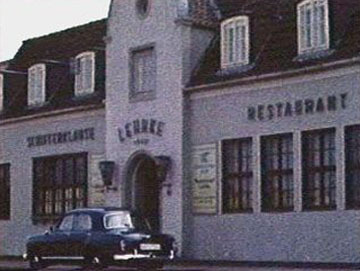 The Restaurant Schifferklause Lehrke was a frequent destination for Mercedes-Benz salesman meals (both lunches and dinners) in 1961. 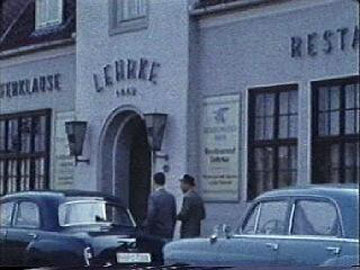 Retrospective: The restaurant owner provided delicious "granatbrot" (a small, seafood shrimp a.k.a. "prawns") for us salesmen in one of his two "chambres separees" so we could eat in relative privacy. 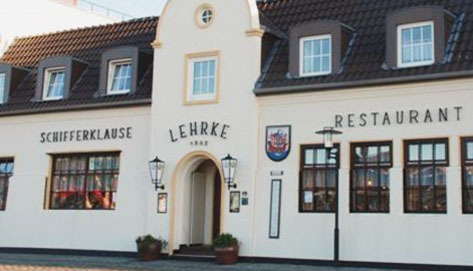 Restaurant Schifferklause Lehrke was still in operation as of 2013. I bought this car in baskets two years ago here in Florida. I saved its soul. I made a lot of good connections for parts and help from mbzponton.org. 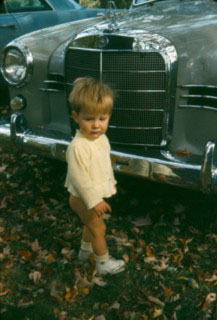 I also have a 1957 cabriolet in Lexington, Kentucky, where I live in the summer. 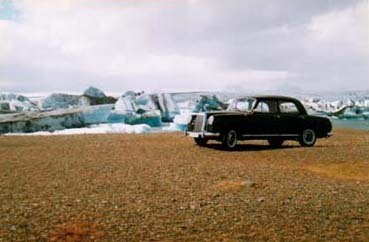 That car is for sale. Hi, my mane is Ghassan Hammoud and I live in Beirut, Lebanon. 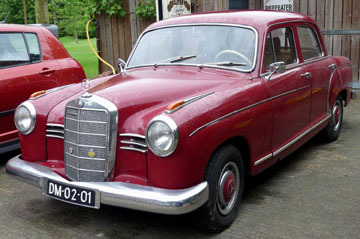 I bought my 1957 Mercedes-Benz Type 180a Ponton sedan a year ago (2007) from a car dealer who shipped it from Germany. 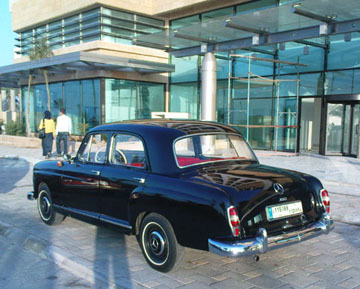 It was renovated in Beirut and is in great condition. 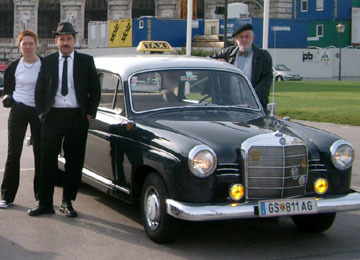 "We wish all Mercedes-Benz Ponton owners happy driving in 2002!" 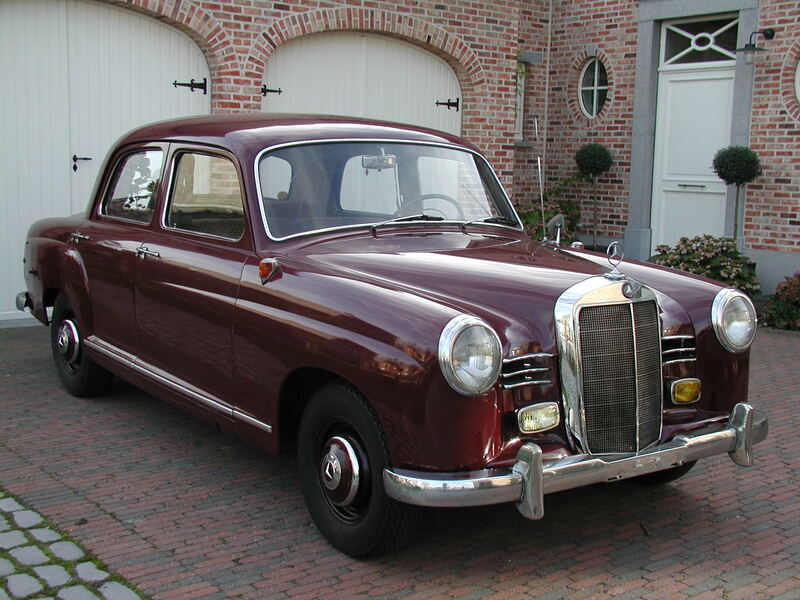 This 1958 Type 180D belonged to Dirk's grandfather. 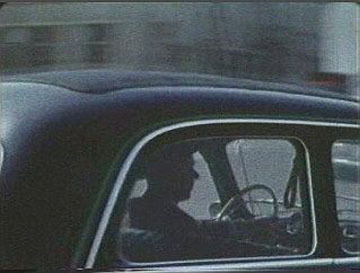 Source: YouTube video "Bob Dylan - Another Self Portrait"
Note the Mercedes-Benz buses in the background. 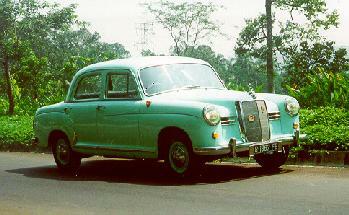 Here's a photo of a friend's 1958 180a taken during a recent drive in the western coastal part of India. 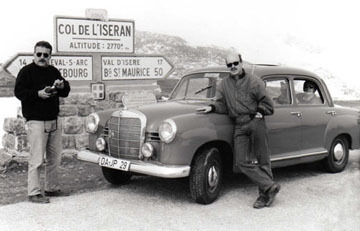 The drive covered 360 km –through some tough roads. 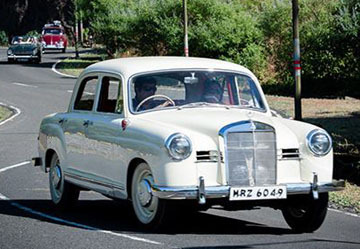 It started from the city of Bombay (Mumbai) and headed toward the hills, which gradually turn into a steep ascent onto the Western Ghats – the mountains on the west coast of India. Lots of sharp hairpin bends and twists with trucks and buses occasionally charging at you from the other side! This car was restored from scrap in 2011. 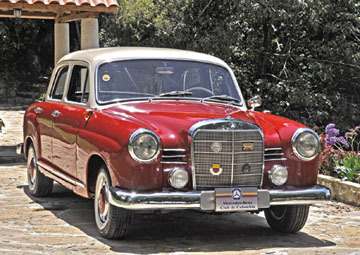 The owner retained the original 15 inch wheels that came with the car (an option for countries with rough roads) and it's right hand drive. 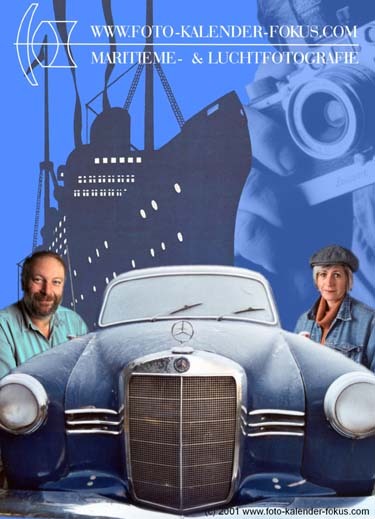 He imported a Becker Europa along with one for my car some six years ago from an IPOG member who was selling his entire trove of radios (I forgot his name). The two Pontons in this photo are a 1958 180a (blue car) and a 1960 180b (white car). 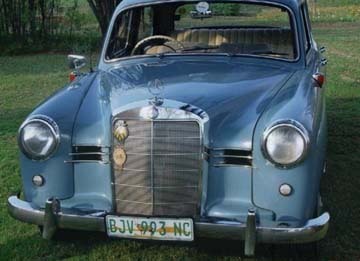 My father bought the blue Mercedes in 1958 and since then, it was passed on to me. 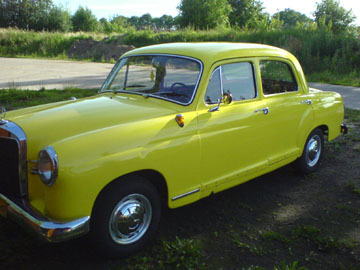 The car is totally original (body and engine) and is still in daily use but will be due, in a year or two, for minor restoration. 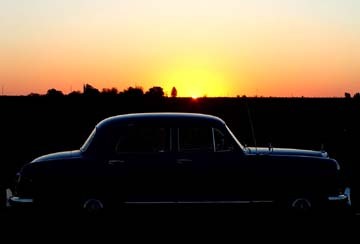 1958 Type W120 180a at the moment of sunset. 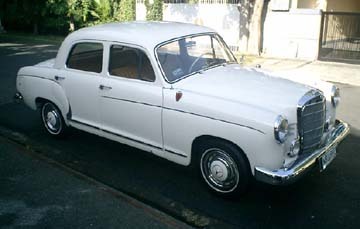 I bought the white 1960 Ponton one year ago with the idea to break it into parts to supply my original 1958 Type 180a sedan. 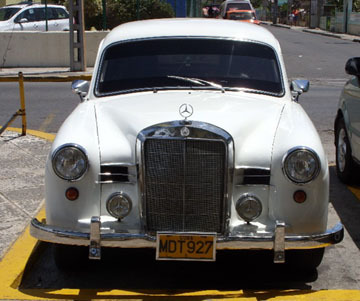 After carefully looking the car over, I realized that it is still in relatively good condition and I decided that a restoration job would be the way to go. 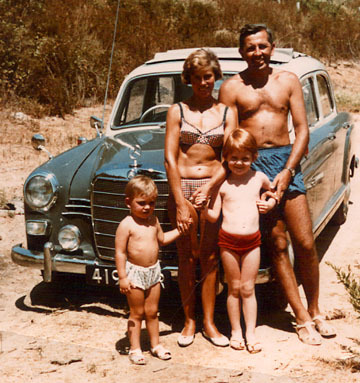 The Ejsmond family in 1965 on the island of Corsica. 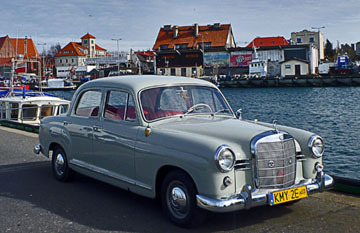 I am living and working in Budapest, but the car is in the Netherlands. 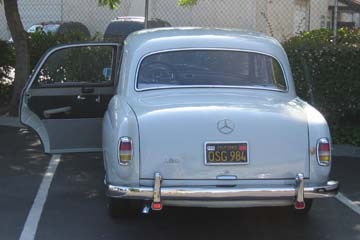 Note the extra brightwork trim accenting the fenders, and the amber fender spear lights. 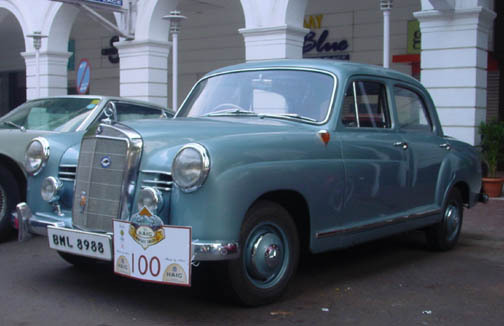 These features are uncommon on the four cylinder models, but the Type 180 and 190 Photo Galleries include other examples of the same. 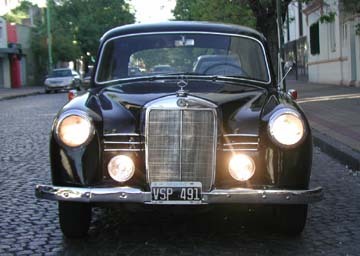 The grille is narrow – like the pre-1959 cars, but the bumpers and tail lights are like the ones used on the mid-1959 and later Pontons. 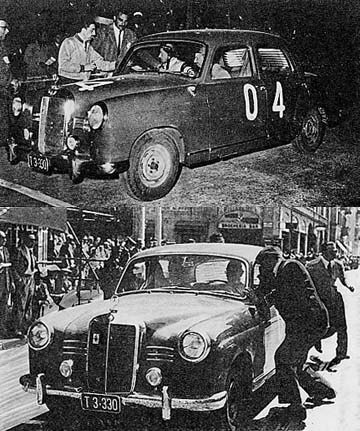 The chassis number would determine when the car was made. Ed. Simon Pontin hosted the weekday morning classical music radio program The Sunshine Show, and the eclectic Saturday morning show Salmagundy; The Show for Working People at WXXI (91.5 FM) from 1976 until his retirement on May 16, 2009. 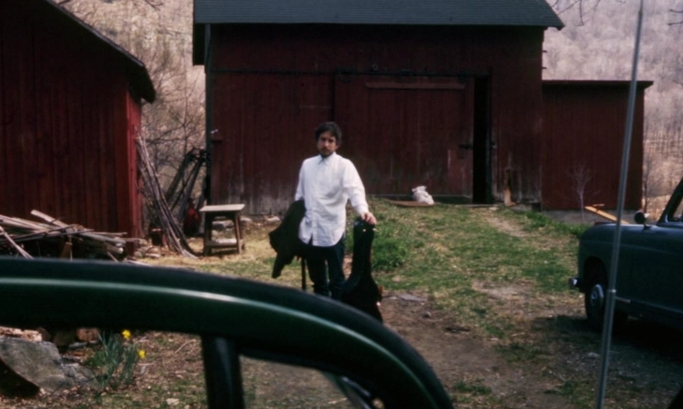 His absence left a hole in the fabric of Rochester's soundscape, and in the imaginations of his regular listeners. Best wishes to you Simon! 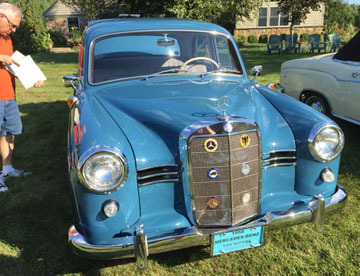 The paint was originally moss green, but the previous owner painted it a metallic green lacquer, so it was prepped and painted professionally in the two-tone, official, Mercedes-Benz Medium-Blue and Ivory epoxy, as shown. The two-tone door panels were designed and installed by our son, Christian, along with the carpet, while the paint was done in Longview, Washington by a professional auto painter, Larry Barnett. 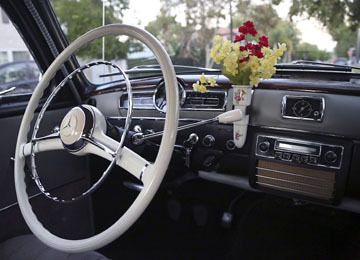 The cream seats were done by Longview Upholstery. Christian acquired the car from a nice, Middle Eastern family in downtown Seattle in February 2015. 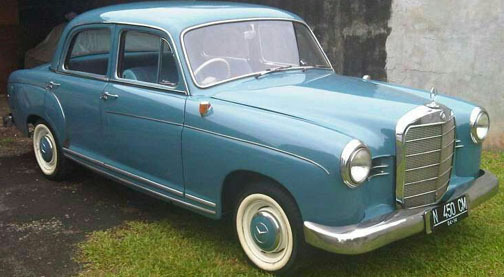 They originally purchased it in Spokane, WA before driving it over to Seattle. When Christian got the car, it didn't run, but the engine block was sound. After he overhauled the ignition system and rebuilt the carburetor, it was running in short order. 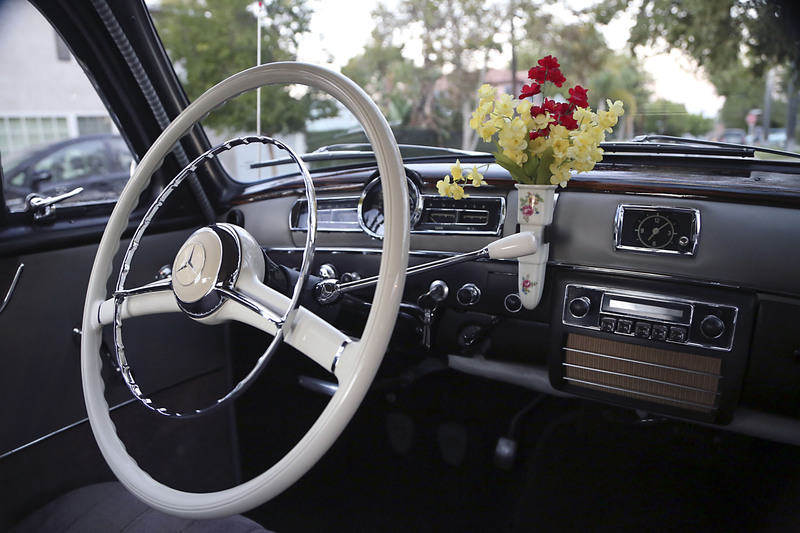 Then, he focused on restoring the interior and paint. 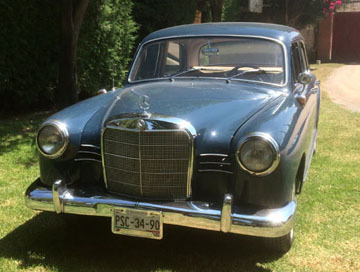 In March 2017 it went to its new owner in Mexico City, Mexico. Because it went through a broker in Texas, I don't know who actually bought it. Hello. My name is Ana Lucia Perez Tobon. Lucana is my artist name. 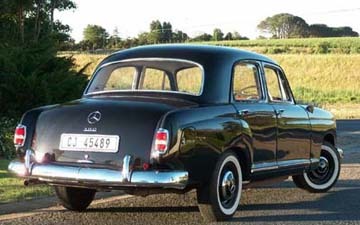 I have owned my 1961 Mercedes-Benz Type 180b Ponton sedan for 18 years, and I bought another one (a 1960 Type 180b) for my son in April, 2006. 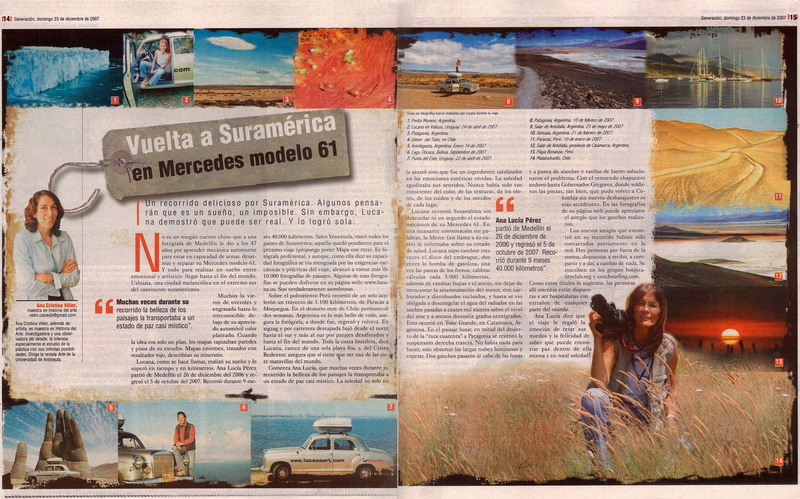 I have worked most of this year (2006) on a project in Patagonia, South America from Colombia with my Mercedes-Benz. She is in very good shape because I DO love her! 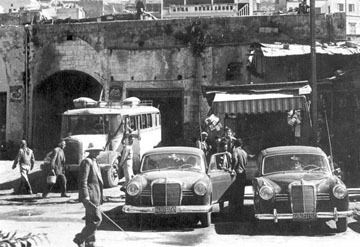 The mbzponton website, with all of its technical information, has been very helpful to me. That is why I write to you - to thank you. If you have any other advice for my car, please let me know. 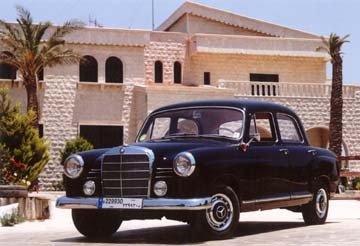 I have a 1961 W120 Ponton 180b, chassis number:120.010.20.029247 and engine: 121.923.20.029430. 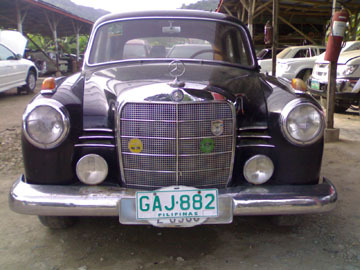 I found the car in a small garage in Jogyakarta, Indonesia in 2009 with heavy dust everywhere (click on the photo to see other photos). Fortunately, the engine still ran even after sitting for three years. 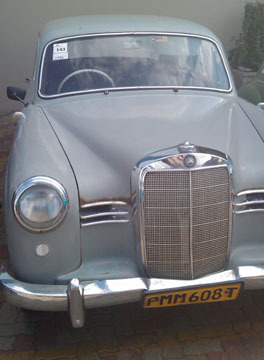 The main body parts are original, but the rear view mirror is missing. I bought it and cleaned it and made some minor restorations. 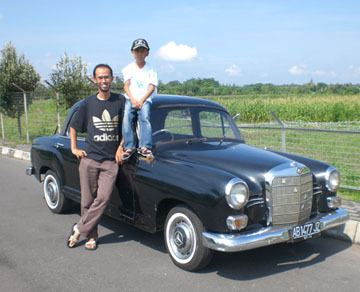 After several months of engine "normalization", I tested it and drove with my 8 year son. He was very happy with "a very very old car like you daddy" he said to me. Next step, I need to fully renovate the engine and of course the body, to make my family and friends smile on this "Kentang" (Kentang in Indonesia means, "potato" because the W120 has a rounded shape. 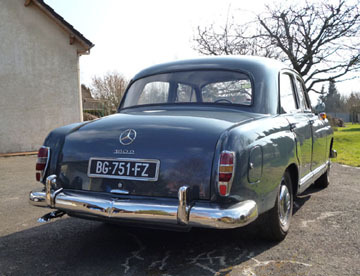 I am not a mechanical engineer and unfamiliar with the old cars, but thanks to the mbzponton website, with all of its technical information, I will be able to manage. See you, I will come back after it is fully restored. 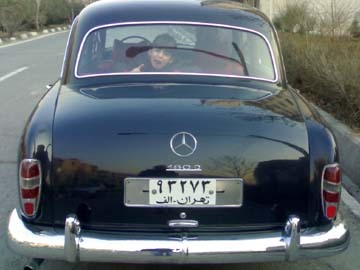 I am a British citizen living and working in Iran. 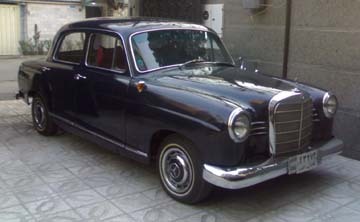 After living in the UK for 29 years, I returned to Iran for business purposes and, upon arrival, found this 1962 Mercedes-Benz Type 180Dc Ponton sedan and immediately bought it. 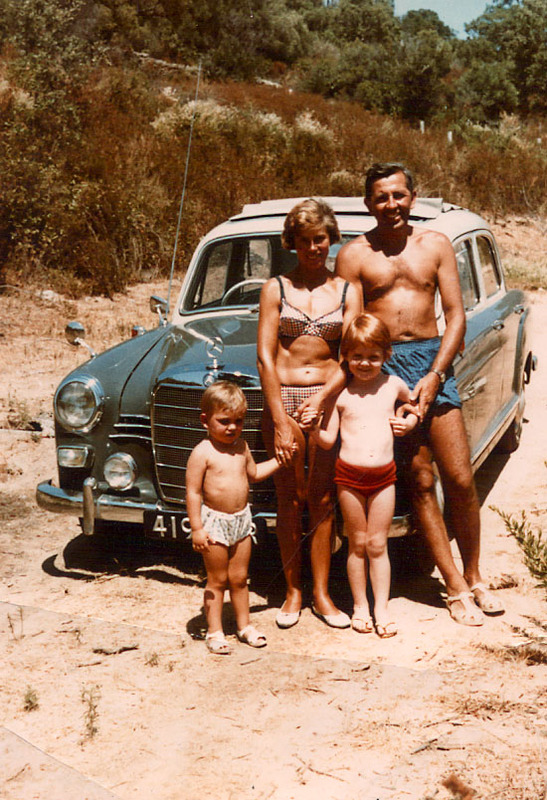 One of the photos I am sending includes my daughter. 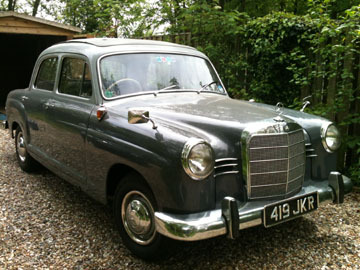 The car is lovely to drive and I have managed to find many spare parts for it. I found your website and enjoy reading it very much. 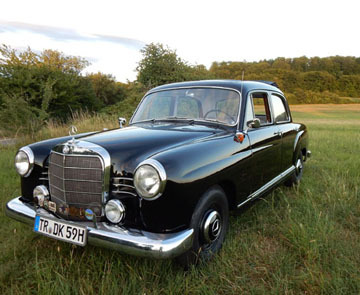 My 1962 Mercedes-Benz Type 180Dc (chassis number 029900) was purchased by myself on May 17, 1963 from Dealer Robert C. Martin of Grants Pass, Oregon — costing $3,886.35. 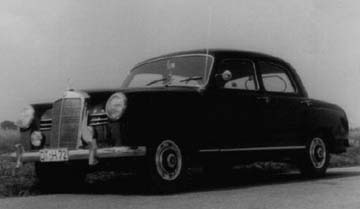 It was a dealer demonstrator used to pick up and deliver people having their cars serviced, and had 5,250 miles on the odometer, but came with a full factory warranty. I had to park it in 1987 due to a personal problem, and it was stored until last year. 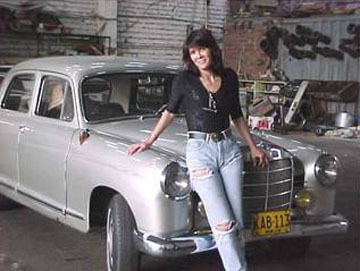 It is now in my new shop building and I have started a restoration to good condition including front-end work, brakes, and paint. It is currently disassembled, and I hope to have it back on the road in 2014. Work is slow as both the car and I are older and slower, however I have done all my own work on it from the time the warranty ran out. 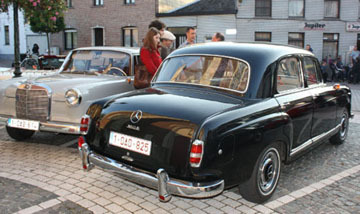 I added air conditioning in 1984 and reclining front seats from a W115 series car in 2010. 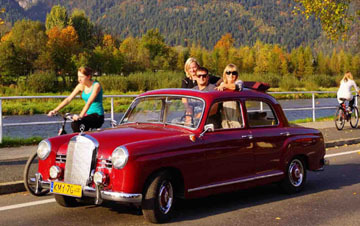 Running at freeway speeds even in the summer with air, the average fuel consumption (with 600,000 miles) is 32 mpg. 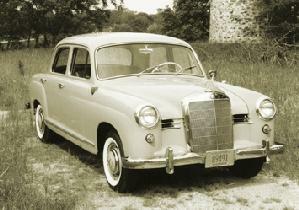 One vacation trip — driving carefully on the take-offs and going no faster than 55 mph, I got an amazing 43 mpg. 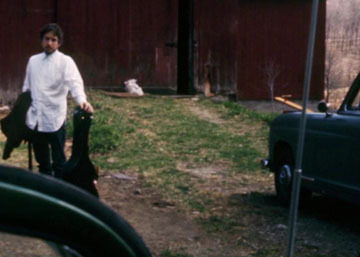 The photo is from 1975, as all the fenders, doors, etc. 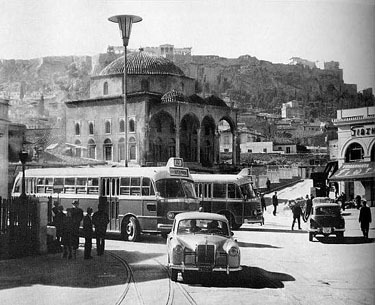 are removed now for the restoration. 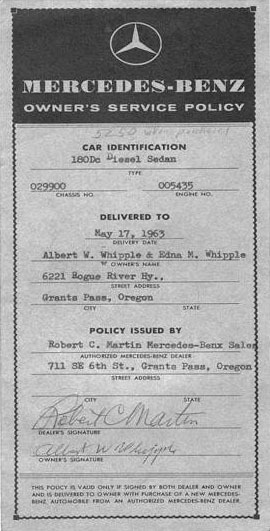 Also please find enclosed, the original Owner's Service Policy with both the dealer's name and mine. p.s. I still live in the same basic location. I moved about 700 feet north of where the photo was taken. I forgot to mention that I rebuilt the original engine at 520,000 miles. It had a broken ring in the number 2 cylinder. 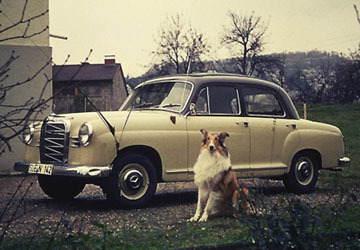 I was a 24 year old single man when I bought the car, and took a lot of razzing over the tractor noise the engine made. I was commuting 50 miles round trip to work at that time, and fuel was 19.7 cents plus 4 cents federal and 6 cents state taxes. Boy, have times changed.